After lunch we continued driving while mirages danced ahead of us across the desert. 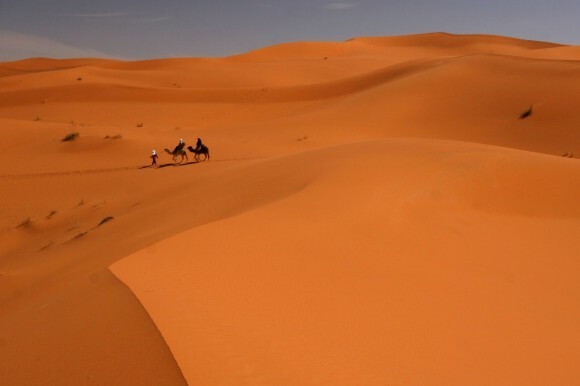 It was a glorious day and I couldn’t stop smiling, an emotion fueled by knowing how far removed we were from the modern world and seeing the most stereotypical of desert images. Camels, mirages—it was getting ridiculous. 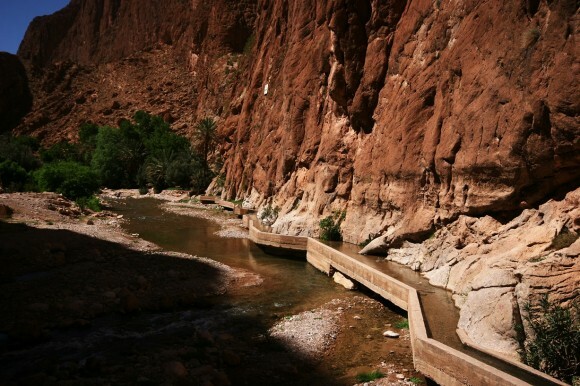 For the day our general destination was the Todra Gorge, running parallel to the Dades Gorge and famous for natural features formed from a massive fault line far below the earth’s crust. There was one spot in particular that everyone came to see where the road threaded through a slot canyon next to a stream, but the entire stretch of road was really quite something. 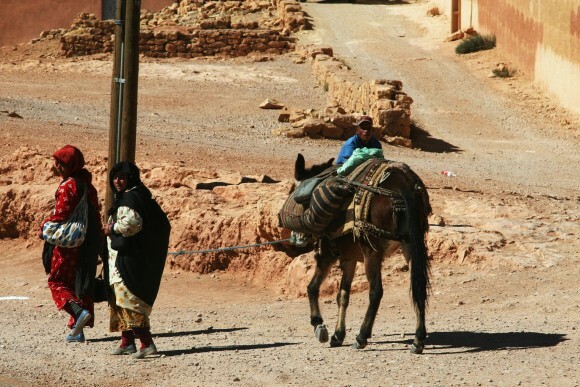 Berber mud brick villages sat back to back with ribbons of palm groves, young children ran down the streets in their headscarves, and local women went about their daily activities dressed in a strange attire of bed sheets wrapped over their regular clothes. 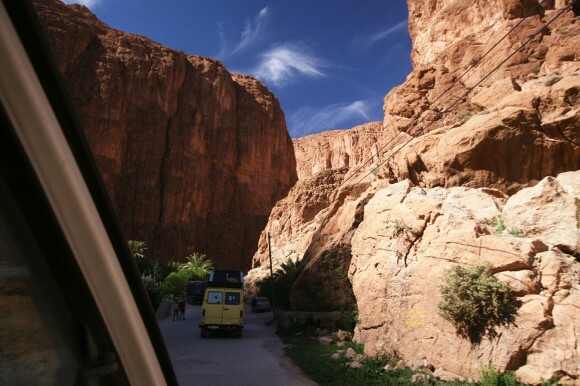 We had passed the last of the mud brick villages when all at once the canyon walls rose up a thousand feet and we were driving through the famed deep and narrow slot canyon where sunshine only reached the bottom for a few minutes each day. Tourist buses parked at the mouth of the gorge, and tourists emptied out and walked through the canyon to take a few pictures and buy carpets from a selection of dozens of vendors. The area was long ago “discovered” and so we continued on, finding that just five minutes up the road the desert was all ours again. 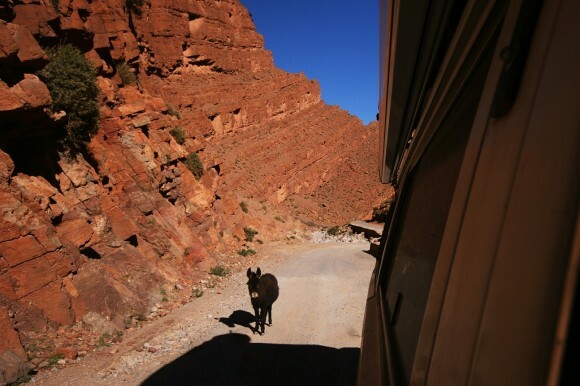 Nomadic shepherds called this part of Morocco home for the season and we saw some of their base camps set up in the canyon walls or just out in the open. 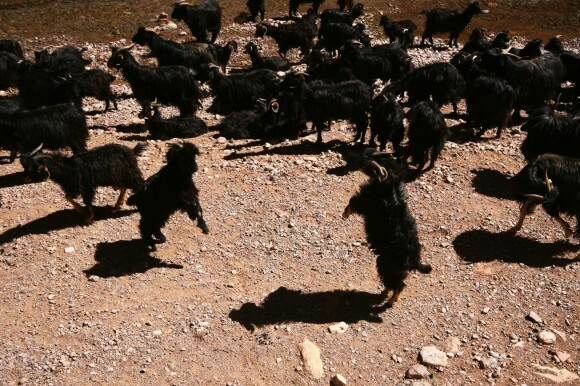 We eventually climbed out of the gorge and drove off into the desert on a jeep track, and set up our own camp near a rock walled corral left unused for the night by the shepherds. 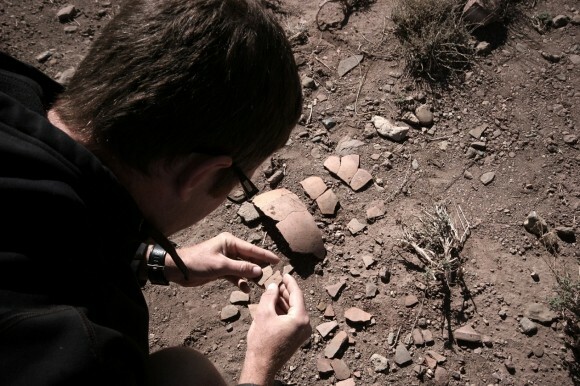 Brad was excited to find the remains of a half buried clay pot near Nacho’s front bumper, which he spent much of the remaining daylight hours trying to humpty-dumpty back together again. The next day we backtracked out of the Todra Gorge and continued east where we were inspired yet again by the landscape. 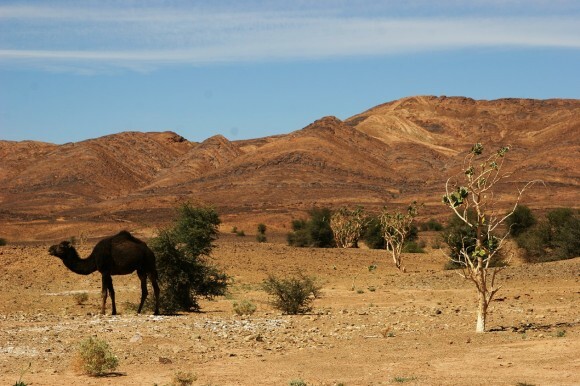 Like green islands in a sea of dirt, desert oases popped up on the horizon. As we reached the villages, Nacho was engulfed in a sea of date palm orchards where men sat along the road and sold succulent dates that hung from their branches like grapes on a vine. Despite not having the space in our pantry for much inventory, we bought a five pound box—the smallest size—for $4 and went on our way. We snacked on the dates like raisins, smiling once again at how awesome life felt at this moment. 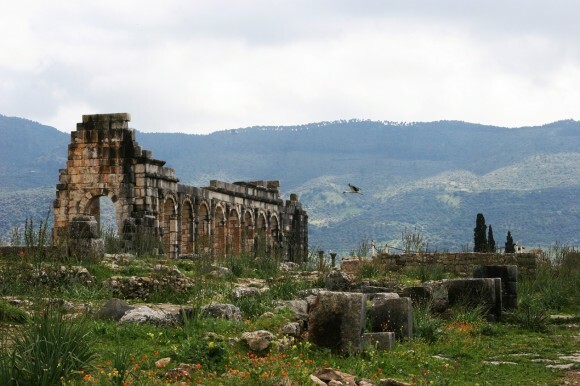 Our resting point for the night came thirty miles from the Algerian border. 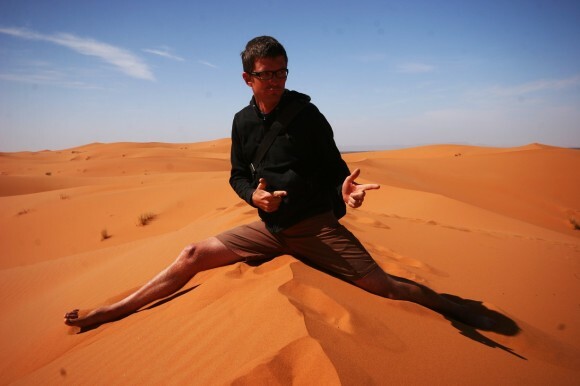 This was one of the places I had been most excited to see—Erg Chebbi! 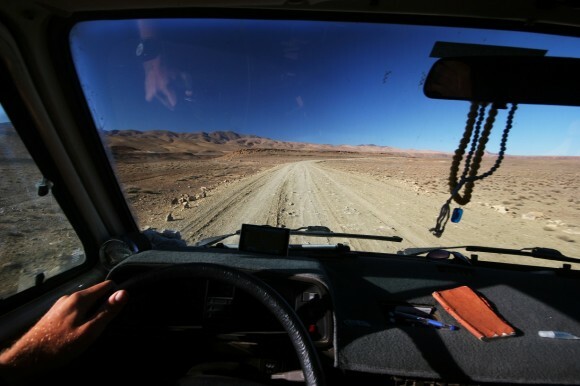 We left the tarmac and headed down a badly rutted and sandy road, which soon turned into faint tracks and then disappeared altogether. Camels lazed around in the distance and only a few hundred feet away the surreal landscape went from pancake flat, blackish sand to a 400 foot wall of golden sand dunes. 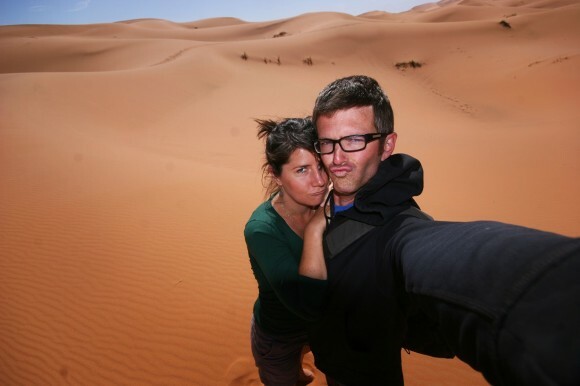 We were at the base of one of Morocco’s two Saharan ergs, or massive sand dunes, created from blowing wind. This strip of dunes was 15 kilometers long by 50 kilometers wide. We drove Nacho as close as we dared and then set up camp for the night. Luxurious oasis resort camps were set up in the distance all around us and tourists took off on camels to explore the dunes at sunset. We watched from our car as the big sandbox lit up into the most unreal hues of fiery orange and red. We awoke to a crisp blue sky and a chilly wind and we joined the dune’s native sand beetle, “the 4X4 of the desert,” to explore the Sahara. We felt giddy and spent much of the morning running across the ridges of the dunes and setting off sand avalanches along the way. 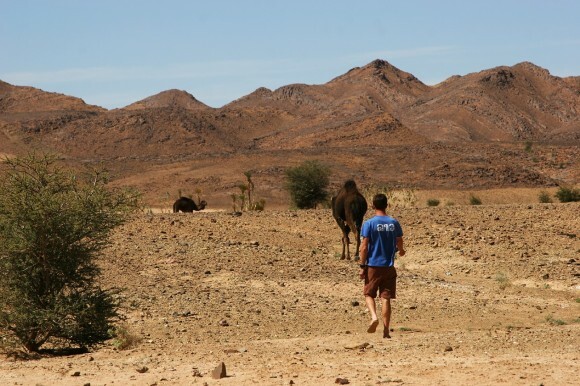 After our adventure in the Sahara we decided it was time to head north. 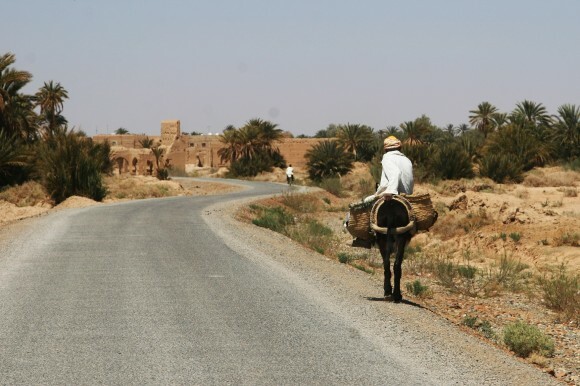 We loaded up and set off, passing through the last swaths of desert oasis and sand castle villages where burka-clad women plied the roads on foot and men zipped around on donkeys or bicycles. 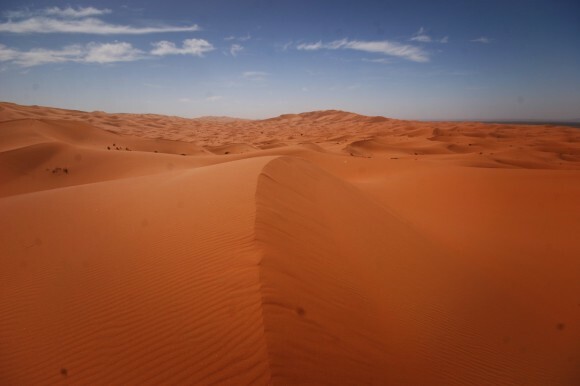 This part of the Sahara had been an ancient seabed between 245 and 570 million years ago, making it possible in the modern age to find an incredible number of minerals and trilobite fossils strewn about and embedded in the soft rocks. 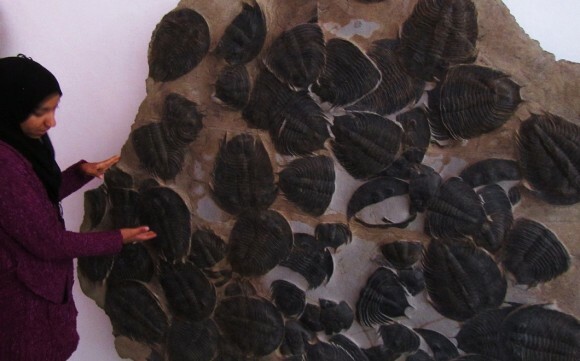 In a museum that housed the largest collection of trilobites in the world we learned a bit about these terrible looking dinosaur bugs, which reached extinction before dinosaurs even came into existence. The next day we crossed back over the High Atlas mountains, transitioning out of the desert and back into Morocco’s rolling agricultural fields. 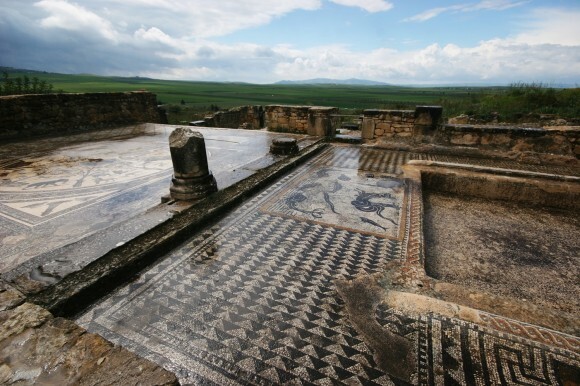 Desert castles and camels disappeared, replaced by dark clouds and sheets of rain. 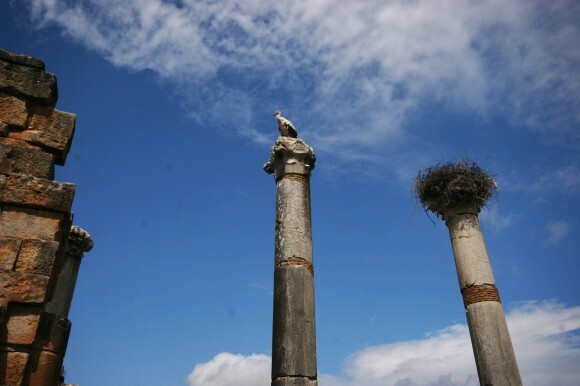 Between the sudden bursts of rain we explored Volubilis, an old Roman city with well preserved mosaics and roman columns now having been overtaken by storks and used to support their massive nests. 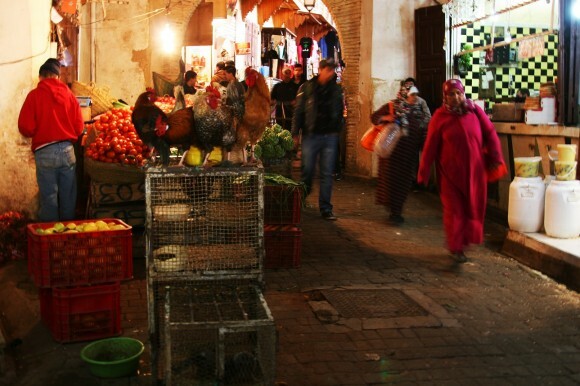 Our last major stop in Morocco was Fes, a 1,200 year old masterpiece of a city with a central medina that is said to be the largest living Islamic medieval city in the world. On top of that it’s also the largest car-free urban environment on the planet. 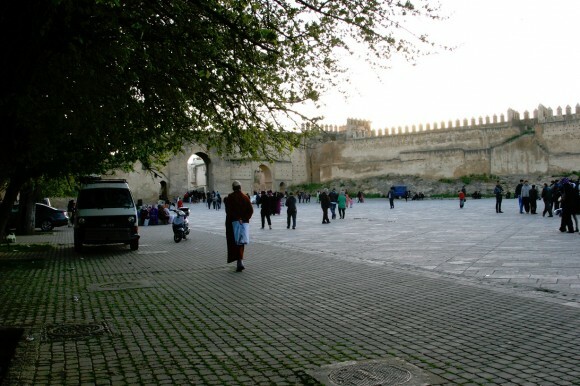 Anything can be had with a little bit of money in Morocco, so we drove inside the walls of the medina and paid the parking attendants to allow us to set up camp under a row of big ancient trees for the next few days. 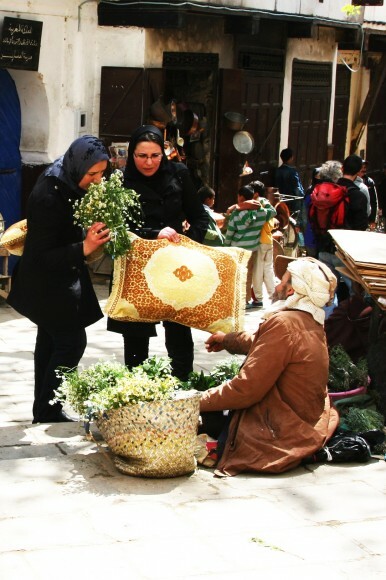 The medina was a mesmerizing spider web of tight cobblestoned streets full of markets and squares, food stalls and tiny ramshackle homes. The markets held my attention for hours at a time, and I periodically lost my bearings and needed a local’s assistance to point me back in the right direction. I went grocery shopping in the produce market which had the most incredible selection of goods, especially its varieties of figs and dates and buckets of chickpeas and hand rolled couscous. 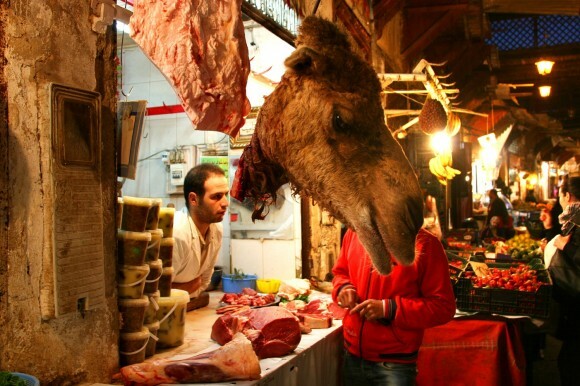 I bought ground spiced beef for making shish kebabs, and now I regret not going for the camel steaks too. In the spice market I loaded up on hanout, a forty spice mix used for flavoring vegetables and meat, and then passed through the pottery market where one could buy painted bowls and plates and clay tagines. 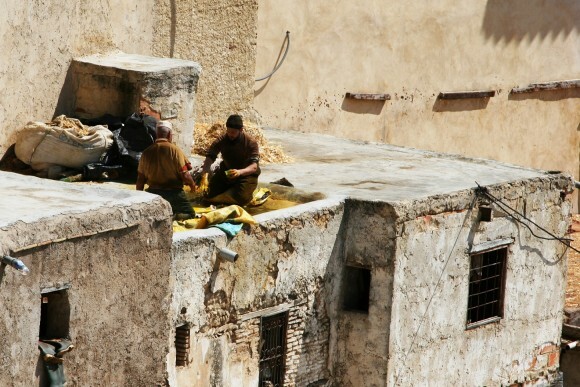 The bronze and copper pot district was equally fascinating and I returned a number of times to watch old men and their apprentices pound out copper pots over charcoal fires. 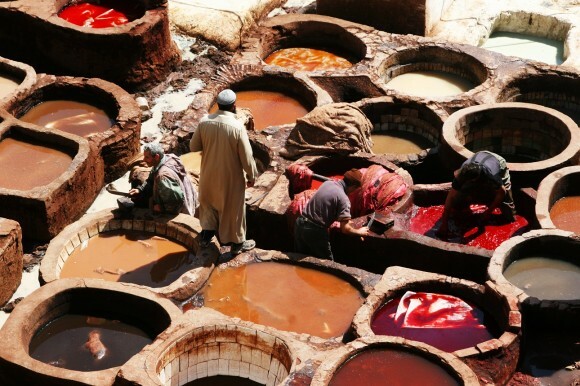 But the most exciting thing I saw in the medina was the tannery—mind you, the world’s oldest—where leather has been handmade for the last millennium. 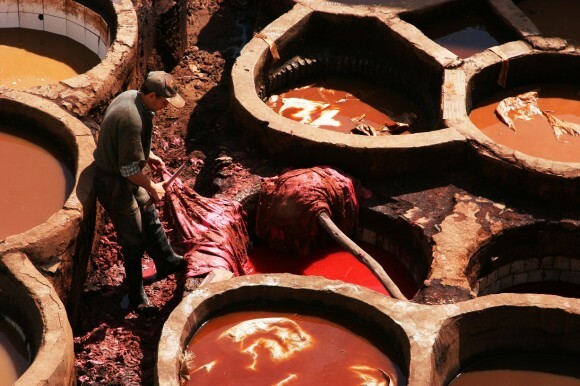 We viewed the tannery from the balcony of a strategically placed leather shop and watched the activity down below as raw skin and sulfuric smells wafted in the air. 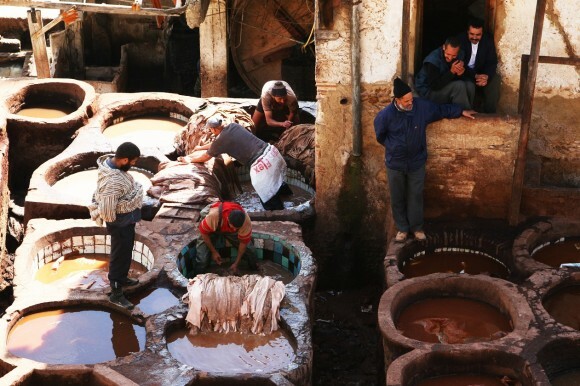 The tannery was organized by task with wash basins and a giant roller for rinsing in the back corner, while the adjacent white-stained basins were filled with a concoction of pigeon crap and cow urine used to soften the leather. 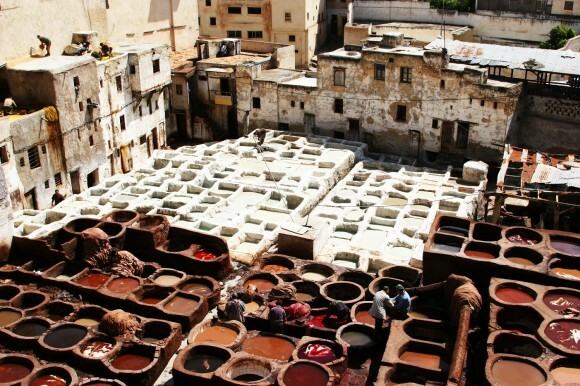 The other basins were used for dying, each filled with natural dyes for staining the leather; blue from indigo and red from saffron. 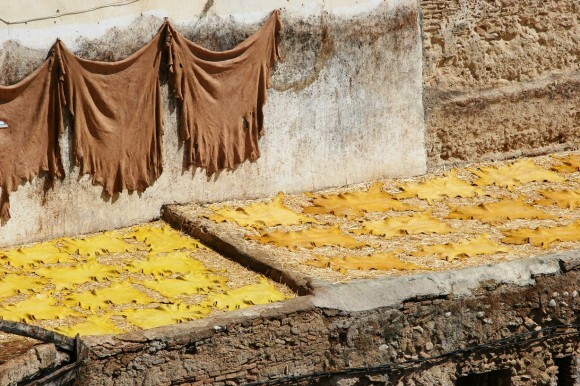 Yellow, made from poppy, was the most expensive and labor intensive, and men on rooftops applied the yellow dye to the leather by hand. 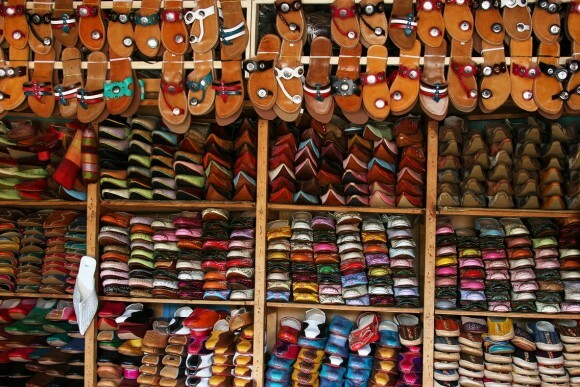 In a world where most things are machine made and rarely touched by the human hand, Morocco completely captivated me on so many levels. After I got my fill of medina life we completed the last leg of our trip: back to the starting point in the far North of the country. After dark on our last day we stopped at one of the many roadside pottery factories and bought a set of individual tagines. With our tagines safely stored next to our every day pots and pans we loaded Nacho back onto the ferry and made the 45 minute trip back across the Strait of Gibraltar. We were finally committed and ready to make a road trip of Europe before heading back to the States. 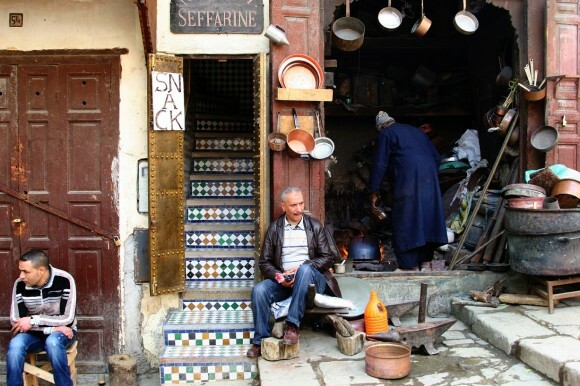 So do Moroccan coppersmiths even care about the price of copper on the US commodities market ? Do they know of such a thing or do they have a “market” all their own ? what a teaser! with a couple of south africa references I thought you guys were going to just keep going!! Hi you two modern day hero’s… wonderful share thanks deeply ! You have yet again sucked me in to a world so far away. I couldn’t stop reading and was disappointed when it was finished. You both are great writers and look forward to your next entry. Thanks for what you are doing as I could never afford to travel the distances you have on my own, never mind with a vehicle. Stay safe and drive Nacho drive. Is six months too late to respond to a comment? Sorry! Sonald & Deborah, in fact before you can cook ina copper vessel, it must be tinned. That means that the vessel has to be heated up and then a copper ingot is rubbed and melted on the inside of the piece to give it a thin coating of tin. This prevents chemical reactions and foul tastes resulting from the copper touching the cooking food. 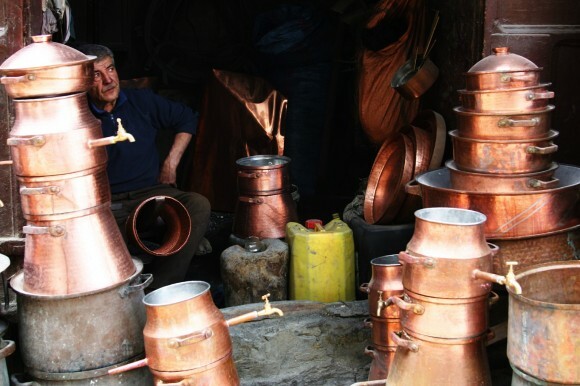 The items in the picture are most likely tinned, as are all copper vessels intended for use, rather than copper clad. These shops start with sheets of raw copper and pound them into shape in a more medieval way.